Weekly Update 2019-04: The winter snowfall always reminds me of Winnipeg indie-rockers Weakerthans, noting the process and journey over the final product in the art of music-making and the simply lovely afternoon I spent at Stamen & Pistil Botanicals. My second semester teaching at BrainStation has kicked off, and I'm feeling like I'm hitting my stride. Some of the students came up to talk to me after class about providing their own topic for their app (as opposed to picking from a provided topic list), and their ideas got me really excited. I finally made time to drum at work this week, and what a time it was. I haven't touched the kit since mid-December when we had our office Holiday party, and it took some maneuvering to get the kit into a shape to play. I couldn't bring myself to drag the thing clear across the room to the private music corner (so to speak), so I was subject to the eyes of a few passersby on the other side of a glass wall...not ideal but I got over it. I'm learning an interesting beat for No, No, No! by Parquet Courts. The song is pretty short and the drum beat something simple, but it's a good foray back into the "rub tummy, pat head" kind of stuff. I tend to have trouble when the bass drum goes off the 1-3 (which this one does), so it's a good challenge for that issue. I'm already halfway through my favourite week of the year (DesignTO Festival) and I am literally floating through the week in a cloud of inspiration. From Come Up To My Room at the Gladstone to Artscape Youngplace to the new MOCA to Dundas West/Roncesvalles to the King East Design District to a secret office tour in Liberty Village, it's almost too much. And that's only what I've done SO FAR. I can't believe what wonderfully delicious specimens of fine art and design my own eyes have devoured, with more to come on the weekend with my mom. Of course DesignTO continues, plus it'll get its very own blog post with all the amazing things I've seen over ten days. I also just really want to show off my custom-made festival Google Map. I volunteered to lead a one-off Intro to UI Design course for BrainStation on Tuesday, which I take as a sort of rite of passage. Those one-night crash courses were favourites of mine when I was starting out in the industry; I liked to hop between them at all the different learning centers around the city core and get a taste of Data Management or Front End Development or Product Management from week to week. Now I get to be on the other side of the class, facing all the bright faces. Nice! I've been reflecting a lot on my own creative process lately, due to an influx of inspiration from the DesignTO festivities as well as my work-goal of improving some of our design processes at Vena. So it would only follow that I'm starting to see process examples in music as well. One example is the musical style of LCD Soundsystem. James Murphy tends to build up these lengthy songs over 5-6 mintues, just layering sound slowly...before a huge culmination when the proverbial "beat drops". I think the only way a song of his, like, say Dance Yrself Clean could be so impactful is because you arrive at the destination after understanding the buildup and where the theme of the music actually came from. It's more about the journey or process than the culmination, though that's always really good as well. It feels well-established and built-up. I also love what Harrison has been doing on Twitter lately. He made a decision to write a new loop every day in January, and it's no surprise that they're all awesome so far. Since it's a short video, I get the added bonus of seeing his facial expressions when he's working, and his setup. I do wish the segments were slightly longer or contained more of an explanation of each daily experiment, but I get that's not the point, it's more about the off-the-cuff nature of it. His method also keeps him focused on the actionable goal of making new music. I'm not really a songwriter by nature, I do love to play other people's songs though. So I guess I'm trying to discover the songwriter in myself by exploring the process of others. Or maybe I just like to see when people show their work behind the scenes. That is the essence of a UX designer, anyway. Nestled into a hip little strip of Dundas West is the cutest little plant boutique I have ever seen. 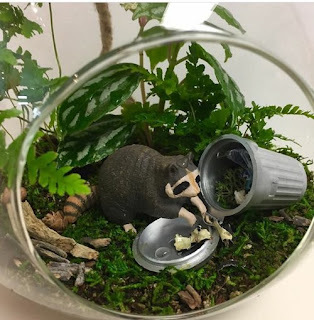 I originally learned about Stamen & Pistil through their wildly popular Toronto-themed "Trash Panda Terrarium", and they've been on my list to visit ever since. My dear ex-roomie Erika surprised me at Christmas with a voucher for Stamen & Pistil, in the form of a Kokedama-making workshop. Now, what is a kokedama, you may ask? Kokedama directly translates as "moss ball" from Japanese. It is usually a single plant whose roots are encased in a ball of moss-wrapped soil. This type of plant doesn't require a pot, and you water it by allowing the ball to sit in a bowl of water every once in a while to gather the moisture it needs. And I got to make two of them! 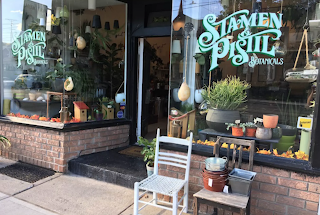 It was simply lovely to spend time with Karen and Maria at Stamen & Pistil for a couple of hours and get my hands dirty in some kokedama soil. 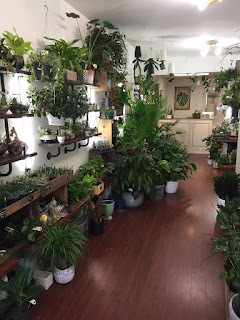 The shop is extremely beautiful and stuffed to the brim with all kinds of greenery. If you need some brightness in your dreary winter, look no further than a stroll through this store. If you've got any sort of affinity for plant life, you'll have a smile on your face in no time. Check out their website for more info.